A video is a fantastic way to provide additional engaging content to your learners. Good news, adding video to Yarno is easy! Just follow the steps to add a video to a Question Explanation screen below. 7. Choose which Video provider you're using. NB. YouTube and Vimeo videos will open and play within Yarno. Videos from other providers will open in a new tab. So the learner will need to close the tab in order to return to Yarno. 8. Copy the URL or ID of the video, and paste it into the Video URL field. NB. If you paste in a URL, Yarno will only display the video ID in the field and will automatically strip out everything else in the URL. That's it, you're done! You can test the link if you wish by clicking on it in the Explanation preview (shown in the image above). 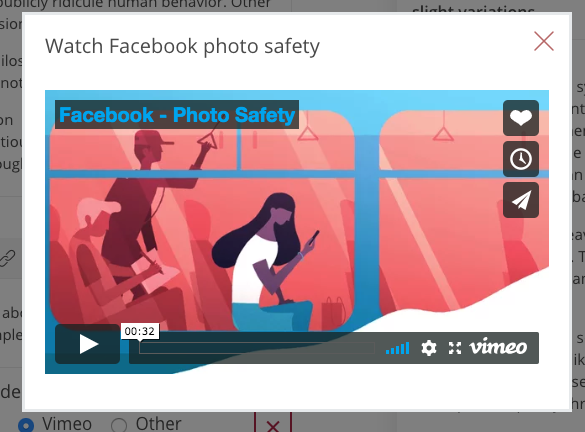 The video should open in a modal on the page, as shown below.